Can tDCS help you meditate? BEFORE YOU READ FURTHER, BE SURE TO CHECK OUT MY NEWEST TDCS REVIEW ON THE TOP TDCS DEVICES AVAILABLE IN 2019. Transcranial direct current stimulation (TDCS) serves as a tool that can potentially modulate the neural circuits in the brain. TDCS does this by increasing or lowering neurons' threshold for sending electrical impulses. By stimulating or inhibiting different regions of the brain, the hypothesis is that one can stimulate or inhibit specific neural circuits, and hypothetically strengthen or weaken those circuits over time. There is a growing body of evidence that supports the effectiveness of tDCS in various psychiatric and neurological disorders. In fact, the European Chapter of the International Federation of Clinical Neurophysiology released an article in 2017 that proposed Level B recommendations (probable efficacy) for tDCS use in chronic pain, major depressive disorder (non-drug resistant) and addiction/craving. There is also evidence to support tDCS effectiveness for cognitive enhancement in healthy people. Moreover, more recent literature suggests that tDCS may provide anti-inflammatory effects, in addition to the more commonly known effects on electrical enhancement/inhibition of neural circuits. In the recent years, brain stimulation with tDCS has gained popularity among people who desire to improve their memory and learning, or to self-treat for depression, insomnia, anxiety. The longterm implications of tDCS are unknown. Due to the potential for negative side effects if the incorrect parameters are used, organizations such as the International Federation of Clinical Neurophysiology (IFCN) and the Annals of Neurology have released statements against 'do-it-yourself' tDCS use. Hence, it is important to find someone who is knowledgeable and who can teach you how to use the tDCS device correctly. Nonetheless, many people continue to express an interest in it and partake in its use due to self-reported claims that using tDCS improves their mood, helps improve sleep, and/or enhances cognition. If you decide to buy a tDCS device, the process may be overwhelming. In the recent years, there has been a plethora of new tDCS devices that have emerged on the market. None of these are FDA approved for medical treatment. However, some of them have been shown through recent studies to adversely affect cognition (i.e., foc.us tdcs). Also, there are a multitude of proposed montages (manner of tDCS electrode placement) on the internet, and it may be confusing as to which one(s) are effective for what. Based on scientific literature, some of these montages produce reproducible favorable results. Some produce non-reproducible favorable results (which means there is not yet enough evidence to support these montages are effective). Other montages produce a lack of effect. And yet other montages produce potentially adverse cognitive results. Hence, it is important to find someone who is knowledgeable and who can teach you how to use the tDCS device correctly. 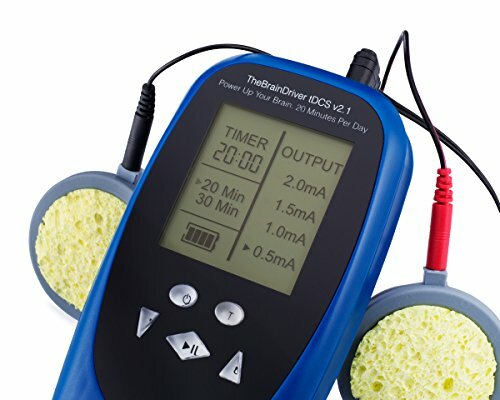 Please refer to our Neuromodulation page for more up-to-date information on tDCS and other noninvasive brain stimulation techniques. We have sifted through all the tDCS devices that are currently available online, and have arrived at our 2018 review. Most of the FOLLOWING DEVICES HAVE BEEN ON THE MARKET LONGER THAN OTHER DEVICES SOLD ONLINE, AND ALSO HAVE STRONG REPUTATIONS. Also be sure to check out our neuromodulation page to stay up-to-date on neuromodulation technology. POST UPDATE (June, 2018): After trialing the Caputron tDCS device recently, I am including it in my updated review. Please note that the Caputron tDCS and the Apex Type A tDCS come in at a tie in my updated review. 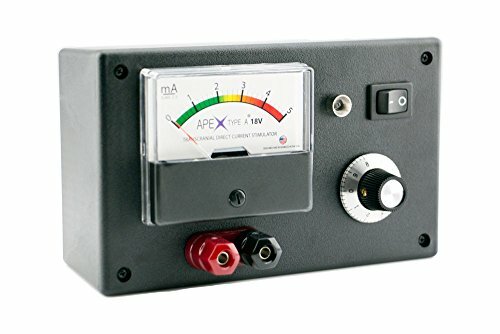 tDCS ApeX Type A 18V Edition. USA made, precision low-noise analog system with all accessories included. Pros: For the quality, price and ease of use, this tDCS device continues to take the number one spot in this review. The tdcs device kit comes with everything included (including two headbands, which improves stability of electrodes on the head) except for the batteries and saline (easy to make at home-instructions are provided). The built-in analog meter allows you to detect whether you have a good connection (and this delivering current through a complete circuit) -a feature not seen in many other devices. The current dial also allows you to decide how much current you desire and how quickly you want to ramp up the amperage - maximum amperage for this device is 2mA (which is the maximum current used in studies involved in tDCS). Customer service is fantastic and responsive. The 18V system is much more efficient than commonly available 9V systems that may be unable to reach stimulation levels adequately. May not be as portable as other tdcs devices, so it may limit your mobility while using it. I usually meditate or read during my 20 minute sessions, so that factor isn't much of a problem. However, it's light weight enough to carry around if you do need move occasionally (13 ounces). Is a bit more expensive than some other cheaper tDCS devices. Nonetheless, I rate it high because it offers quality at a lower cost. Battery life monitor, which informs user when battery needs replaced. Maximum current is 4 mA, which is double the maximum current deemed safe in tDCS studies (2 mA). Hence, there is potential for misuse if the user does not have experience. However, Caputron offers a separate device that is also FDA cleared whose maximum current limit is 2 mA - an option for those concerned about safety with the original device. Pocket sized and portable tDCS for travel (12ounces). The smaller electrodes (2inch diameter) may theoretically concentrate the effects of the current applied to the brain region desired. No meter to ensure adequate current connection. Only using one 9-V battery, so may have trouble reaching adequate stimulation levels. Only one headband is provided, which can make certain montage positions more difficult to maintain during sessions. However, you could always purchase additional tight headbands separately at your local pharmacy or online if needed. Cost effective - this device is the most affordable of all the devices on this review. The manufacturer also offers a money back guarantee in case you aren't happy with the results. Comes with a free "mind-enhancing vocabulary and memory-improving" software program, which some may find beneficial. The listed cost above is variable based on the different websites selling it. The link provided to the right is to the ebay website, which currently sells the device for the lowest cost at $77. The Omni Stimulator product website has it listed at $169, with a current sale offer of $99. This tDCS device only uses one 9-V battery, so you may have trouble reaching adequate stimulation levels. Also, battery replacement requires the use of a screwdriver which may be more cumbersome. This tDCS device is used in the clinical and research setting, and is approved in select countries for the treatment of chronic pain (including migraine and fibromyalgia) and depression. There are two separate devices meant for two separate conditions: depression or chronic pain. These devices differ in that the montages (electrode positions on the head) are fixed, thus minimizing the risk of improper placement. Not yet approved for use in the United States or Canada. Approved for use in the European Union, Australia, Brazil, and Singapore. Which tDCS Protocols Actually Work? Is Transcranial Stimulation / Noninvasive brain stimulation Safe? *Ratings are based on a 5-point scale and incorporate length of time on the market, quality of the device, cost, ease of use of the product, international availability, and customer reviews from various websites. Disclaimer: The information and devices displayed on this site are not intended to treat, cure, or prevent any medical disease, and this article is not considered to be medical advice. If a reader decides to purchase and use a tDCS machine, it is his or her responsibility to use it correctly and safely and ensure that it works correctly. Please note I received the caputron tdcs device as a complementary gift from the manufacturer. This did not influence my decision in including the device in the review.